"As the early-morning bugle-call of covered wagon trains fades away among the echoes, another true Death Valley days story is presented for your entertainment by the Pacific Coast Borax Company, producers of that famous family of products – 20 Mule Team Borax, 20 Mule Team Borax Soap Chips and Boraxo. 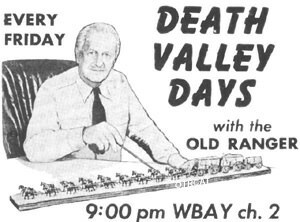 One of the most respected shows of early radio, Death Valley Days was well written and endured throughout the decades. Ruth Cornwall Woodman was asked to write the show in 1930. Though she knew nothing of the desert and its people, New York Vassar graduate Ruth undertook the project with enthusiasm. When the show began in 1930, many of the areas she was writing about were still quite rough in nature, with many roads but mostly mere trails. Each year Ruth would spend several months traveling through the desert to explore ghost towns, saloons, backpacking just outside Death Valley, and interviewing old timers. She would talk to gas station men, bartenders, and small town newspapermen. She did her research well, pouring over old newspapers and visiting old west museums, scouring the west for anything that would inspire a good story. The result of all this hard work was rewarding - a highly successful show that lasted over two decades, and later became a television show with Ronald Regan as the host. Death Valley Days presents stories of the old west, with realism and drama virtually unmatched by other westerns of the day. I remember this show in its television incarnation, hosted by Stanley Andrews as \"The Old Ranger.\" Andrews was succeeded by Ronald Reagan, who hosted it until sometime in 1966, when he ran for Governor of California. 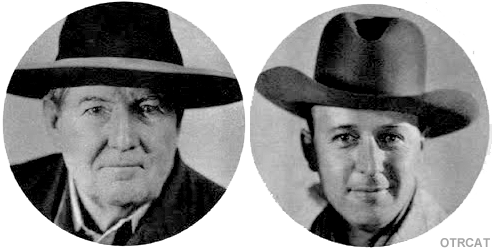 Reagan was succeeded by Robert Taylor, who was later succeeded by Dale Robertson.